Ram, a dedicated truck brand, is a relatively new addition to theChrysler Group, an American automaker. The division was started in2009, when Chrysler formed a business alliance with Fiat. As a result,Chrysler launched its all-new Ram brand as an outlet for its trucks(Dodge will continue as the brand for automobiles). While the new brandcarries the unique Ram name to remind customers of the lineage, thetruck models will wear Dodge emblems in addition to their Ram emblems(the "Ram" name comes from the hood ornament that adorned theautomaker's trucks in the 1930s). The company's current lineup contains only trucks, both designedfor private and commercial use. Ram sells vehicles that operate withgasoline and diesel powerplants. Models include both rear- and 4-wheeldrive. Headquartered in the United States, Ram manufactures its trucksin North America (United States and Mexico), for sale in markets aroundthe world. The Ram 1500 is a full-size, half-ton pickup truck. Firstintroduced in 1981, the Ram 1500 is built on a traditionalbody-on-frame platform and offered in three different cabconfigurations. It competes directly against the Ford F-150 andChevrolet Silverado 1500 lineups-both competitors offer similarly sizedvehicles with like configurations. When it was launched, the first-generation Ram 1500 models were notall-new models. In fact, they were facelifted versions of the carryoverDodge D-Series pickups (the "new" Rams arrived with a new interior, newheadlights, new taillights, and a new dashboard and instrumentcluster). An all-new second-generation model arrived in 1994(introducing the model's familiar "big rig" styling), with the all-newthird-generation model following in 2002. The current,fourth-generation Ram 1500 debuted in 2009. The standard powerplant on the Ram 1500 is a V-6, with two V-8engines on the option list. Rear-wheel drive (4x2) is standard, while4-wheel drive (4x4) is optional on all models. The Ram 1500 (Quad Cab4x2 Short Bed 5.7-liter) is able to tow up to 15,500 pounds, accordingto the automaker. Ram has made several changes to its truck for 2011.These include a new "Ram Outdoorsman" trim level (fitted with exclusiveinterior and exterior appointments designed to appeal to outdoorsmensuch as hunters, fishermen, campers, and boaters), additional standardequipment, new options, and several new exterior colors. The Ram 2500 "Heavy Duty" (HD) and Ram 3500 HD are full-size,three-quarter-ton (2500) and one-ton (3500) pickup trucks. The Ram 2500HD and Ram 3500 HD model introductions mostly mirror the generations ofthe half-ton Ram 1500 (introduced in 1981). However, the 2500/3500models feature a more sturdy, full-boxed frame when compared to theirlighter 1500 sibling. In addition, the largest engine on the 1500 model(5.7-liter V-8) is the smallest engine offering on the 2500/3500models. The 2011 Ram 2500/3500 is offered in Regular Cab, Crew Cab and MegaCab configurations, with a choice of short or long bed. The Ram 2500(Regular Cab 4x4 Long Bed 6.7-liter) is able to tow up to 15,450 poundswhile the Ram 3500 (Regular Cab 4x2 Long Bed 6.7-liter) is rated to towup to 17,600 pounds, according to the automaker. 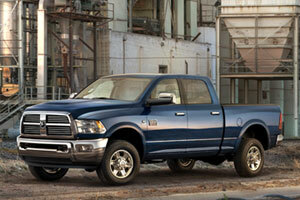 Ram has made severalchanges to the 2500/3500 models for 2011. These include a new "RamOutdoorsman" trim level (fitted with exclusive interior and exteriorappointments designed to appeal to outdoorsmen such as hunters,fishermen, campers, and boaters), more standard equipment, new options,and several new exterior colors. The 3500 Chassis Cab/4500 Chassis Cab/5500 Chassis Cab are Ram'slargest full-size truck offerings, and are designed primarily forcommercial customers. There are three chassis weights: 3500(three-quarter ton), 4500 (one-ton/Class 4), and 5500 (Class 5). TheChassis Cab models differ from their lighter 2500 HD and 3500 HDsiblings in that the fully boxed frame is constructed withhigh-strength steel-it is a commercial frame. Compared to the HD models, Chassis Cab models are also offered withlarger fuel tanks, larger brake systems, integrated trailer-brakecontrollers, and power take-off (PTO) capabilities to run externalequipment. The 2011 3500 Chassis Cab/4500 Chassis Cab/5500 Chassis Cabis offered in Regular and Crew chassis configurations. The rear frameis industry-sized, to allow a variety of beds, boxes or other truckplatforms to be installed. When properly configured, Chassis Cab modelsare able to tow upwards of 18,000 pounds, according to the automaker. Ram has made several changes to the 3500 Chassis Cab/4500 ChassisCab/5500 Chassis Cab models for 2011. Most noted is the new exteriordesign and styling. In addition, the Crew Cab is larger (for more legroom) and the fuel capacity has been increased. There are also numerousother changes, mostly designed for the Chassis Cab's various commercialapplications. The Ram Dakota is a midsize pickup truck. It was first introducedin 1987 as a pickup that could combine the payload and capacity of thefull-size truck, yet offer the fuel efficiency of a small truck (itoriginally was offered with a 4- or 6-cylinder engine). Today, theDakota is in its third generation, last redesigned for the 2005 modelyear. The 2011 Dakota features a ladder-type frame with "hydroformed"main rails (they are fully boxed to improve strength and rigidity). Allmodels feature an independent front suspension with coil-over shockabsorbers. The standard engine is a 3.7-liter V-6, but Ram also offersa 4.7-liter V-8 for those seeking more power. When properly equipped,the Ram Dakota is able to tow up to 7,250 pounds, according to theautomaker. The 2011 Ram Dakota is mostly a carryover from 2010, but theautomaker has improved the standard safety equipment with the additionof side curtain air bags and anti-lock brakes as standard equipment.